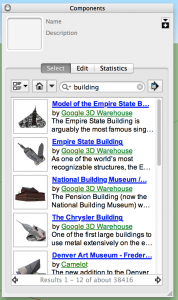 SketchUp is a 3d modeling program that became popular while it was owned by Google. It is often used for architecture and interior design, though it can also be used for smaller product design as well. SketchUp was first created by Last Software and released in 2000. I first heard about it (and I think a lot of people as well) after Google bought the company in 2006. They released a few more versions of it before selling to Trimble last year (2012). 2 versions are available: Free for home and personal use, and Pro for, well, Pros. The Pro version is $495.00, though Students can buy a pro license is $50.00 but it cannot be used for commercial work under their terms of service. SketchUp is fairly straightforward to use as far as 3d modeling programs go. The controls are pretty sparse in the free version, though I’m not sure how that compares with the Pro edition. Drawing and extruding are pretty intuitive. There also seem to be many tutorials online. One of the most interesting aspects of SketchUp is the integration with Google’s 3d Warehouse, which is a community-driven online collection of models that can be downloaded and used in your projects. The warehouse is accessed within SketchUp by going to Window > Components. 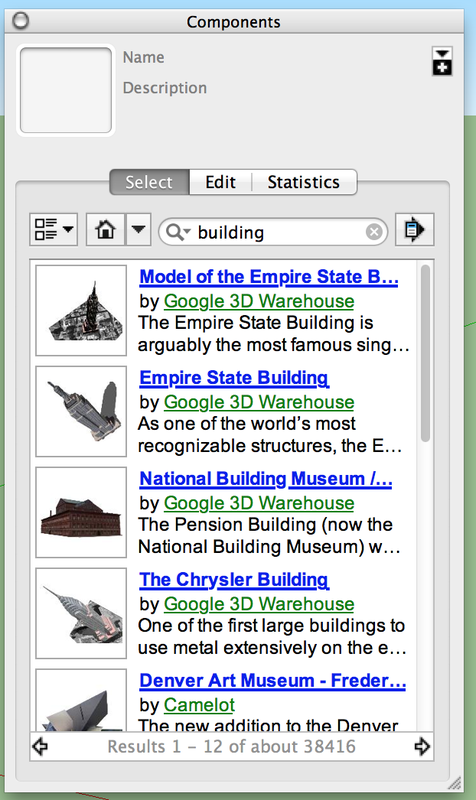 You can search for objects there and if you’d like, you can contribute objects as well for others to use. SketchUp is extensible through ruby scripts. These add functionality like additional drawing tools, export options (such as exporting to GCode for 3d printing), etc. The landing page is here though you will probably have better luck just googling for what you need directly. All in all, SketchUp seems like a good tool to have around. It’s free, its pretty simple to use, and seems to be used quite a bit in certain industries. The only other 3d modeling program I have a good deal of experience in is Blender. In comparison, SketchUp seems simpler, but maybe not quite as powerful.